The same dish they have for takeaway at Whole Foods with better salmon and less sweet teriyaki. Sushi rice (in the rice cooker or heat rice with 1 teaspoon canola oil and a teaspoon of salt and then for every 1 cup of rice add 1 1/2 cup water). Carrots, red pepper, and broccoli steamed (start carrots first, then red pepper, then broccoli). Pan sear salmon however done you like (remove pin bones if needed). I have been using Silver Coho Salmon I found at Trader Joe’s and it has been very tender and delicious. Mix teriyaki sauce: in a measuring cup add a heaping spoon of cornstarch, then stir in soy sauce until you have a smooth slurry. Then equal parts soy sauce, mirin rice wine or sake, brown sugar. Add a teaspoon of grated ginger and fresh ground pepper to taste. Microwave a minute at a time until thickened or bring to a boil on stove. Garnish with toasted sesame seeds. Maybe some thinly sliced scallions too. 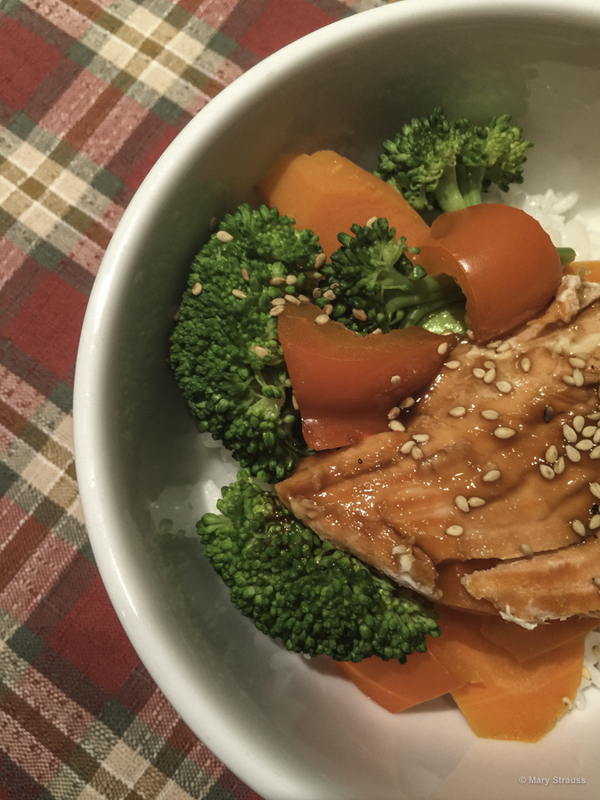 This entry was posted in Bentosh and tagged Salmon, Teriyaki, Vegetables on November 30, 2017 by mrstrauss.